NEW YORK—Friday, July 29, 2011: Call it the “ripple effect”—the real estate world continues to buzz as the spectacular upper floor residences of New York by Gehry are released to an eager market and renters continue to throng the rental gallery to seek a home created by the architect, Frank Gehry. Praised by architecture critics and beloved by photographers worldwide, the 76-story New York by Gehry—with its stainless steel cladding draped like fabric—is an inspired addition to the Manhattan skyline, a shining symbol of Lower Manhattan’s resurgence as a vibrant residential, commercial and cultural neighborhood. Following the exceptionally successful springtime release of studios, one-bedroom and two-bedroom rentals on the lower floors of Eight Spruce Street, the focus moves skyward, to floors 40 through 76 with larger, family-friendly two-and-three bedroom residences, featuring unique layouts, expansive views and elegant finishes. During a sunset event held Tuesday, July 26th, over 150 specialty brokers got their first look at these upper floor apartments, presented by developer Bruce Ratner and architect Frank Gehry. The party showcased a terraced three-bedroom model unit on the 52nd floor with expansive views of the city. Guests enjoyed skyline panoramas featuring the Empire State Building to the North, the Freedom Tower and Hudson River to the West, and the Brooklyn, Manhattan and Williamsburg bridges to the East. Guests also toured the building’s newly opened, 22,000sf of amenity spaces and new model apartments on the 45th floor. This broker preview event was catered by renowned chef David Bouley, featuring selections from his newest venture, Lower Manhattan’s acclaimed eatery, Brushstroke, a much-anticipated culinary collaboration with Japan’s Tsuji Institute. In a rare arrangement, Frank Gehry not only designed the building’s exhilarating façade but all of the interiors and amenity spaces, curating all finishes and fixtures, and styling the building’s 20 model apartments. The artist’s hand is in evidence throughout Eight Spruce Street–from the striking sculptural concierge desk in the lobby to the screening room’s free-form amphitheater-style seating in the amenity space, constructed in Gehry’s signature honey-colored vertical grain Douglas Fir. New York by Gehry’s 37th floor Rental Gallery has been a hub of activity since the building opened in February. Its leasing and marketing team—Citi Habitats Marketing Group led by Cliff Finn, and Nancy Packes, Inc. led by Nancy Packes—can attest that the building has arrived on the luxury rental marketplace at the perfect time to meet a healthy demand. Residents of New York by Gehry have exclusive access to a host of lifestyle services extending from a full-service concierge, on-site valet services to health, wellness, social, and entertainment amenities across 22,000 square-feet of indoor and outdoor space. A 6th floor Grilling Terrace with stunning views of the Woolworth building is outfitted with dining cabanas, picnic tables and café seating. The adjacent Game Room with billiard tables, gaming consoles and golf simulators is furnished with custom seating by Frank Gehry. On the 7th floor, a 50-foot sky-lit swimming pool is surrounded by fully-retracting glass doors, creating a seamless expanse of indoor and outdoor spaces that includes a wraparound sundeck. Overlooking City Hall Park to the north, a large Drawing Room with a grand piano is adjacent to a Private Dining Room which can be reserved for resident events and serviced from a Chef’s Demonstration and Catering Kitchen. A Spa Treatment Suite and state-of-the-art Fitness Center with views of the Brooklyn Bridge are located on the 7th floor, with Group Fitness, Pilates and Private Training Studios on the 8th floor. A Tweens’ Den and a Children’s Playroom are outfitted with games and toys to engage younger residents in the building. A Screening Room features Gehry-designed amphitheater seating and a Library with a well-curated collection of books and periodicals has seating nooks and reading tables for quiet enjoyment. The amenity spaces are alive with robust programming tailored to tenant interests. Golfers can arrange a workshop with a top teaching professional. The pool hosts safety swim classes for children. The Fitness Center offers top tier personal training, Pilates instruction and Golden Gloves-winning boxing instruction. Post-workout, treatment rooms await those seeking world-class massages and facials. In addition to a speaking program in the Drawing Room and films in the Screening Room, the Chef’s Kitchen will be a venue for events presided over by some of the culinary world’s biggest names. Kids can look forward to weekly story-time and take part in art and music classes. The Tween’s Den is perfect for Gossip Girl Mondays, Rock Band Fridays and more. The mixed-use development includes a five-story, 100,000-square-foot public school, the first ever built in New York City on private land, set to open this September, as well as doctors’ offices for physicians associated with New York Downtown Hospital. There will also be 1,300 square feet of neighborhood-oriented ground-floor retail space and 26,000 square feet of below-grade parking for 175 cars for hospital use. Another highlight of New York by Gehry is its ground floor outdoor open space, two beautifully-landscaped public plazas totaling 15,000-square-feet, designed by Field Operations, the creative force behind Manhattan’s High Line, in collaboration with Dutch horticulturist Piet Oudolf, who collaborated with Gehry on Chicago’s Millennium Park. 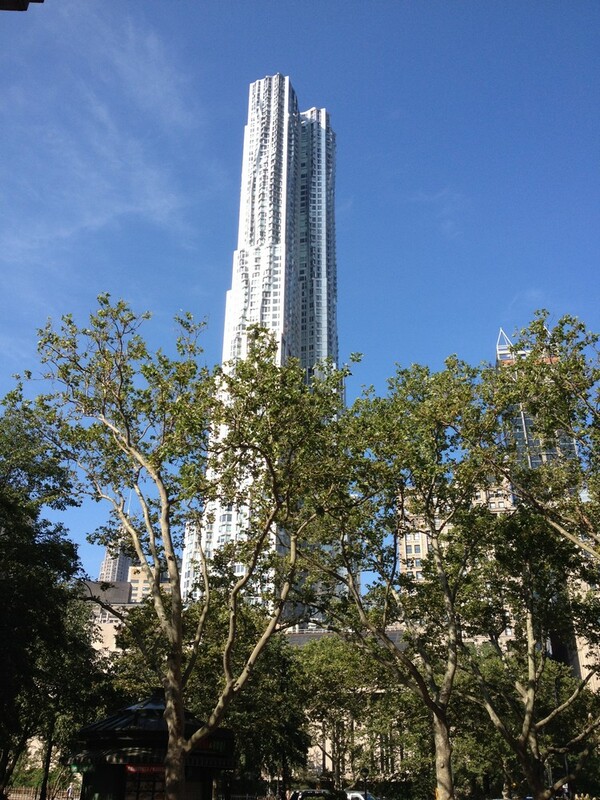 Frank Gehry, Gehry Architects New York P.C. Frank Gehry has been the recipient of dozens of the most prestigious prizes in architecture, including the 1989 Pritzker Prize, which honors “significant contributions to humanity and the built environment through the art of architecture.” New York by Gehry is Frank Gehry’s first high-rise residential mixed-use commission in New York City. Among the many notable buildings designed by Frank Gehry are the IAC headquarters in Manhattan, completed in 2007; the Walt Disney Concert Hall in Los Angeles, completed in 2003; and the Guggenheim Museum Bilbao in Bilbao, Spain, completed in 1997. 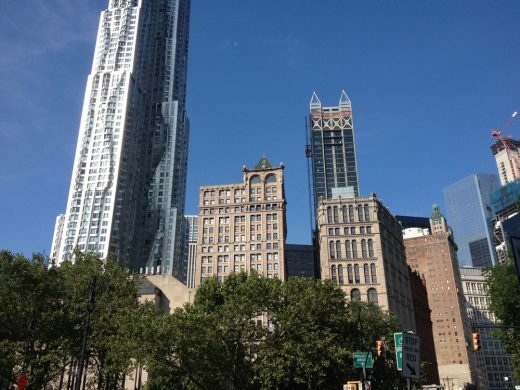 Forest City Ratner Companies, a wholly owned subsidiary of Forest City Enterprises, owns and operates 31 properties in the New York metropolitan area including Downtown Brooklyn’s transformative MetroTech Center and the acclaimed Renzo Piano-designed New York Times Building in Manhattan. Forest City Enterprises, Inc., an $11.5 billion NYSE-listed national real estate company, is principally engaged in the ownership, development, management and acquisition of commercial and residential real estate and land throughout the United States. New York by Gehry at Eight Spruce Street images / information from Geto & de Milly, Inc.